Capital, Celsi, Dimplex, Dovre, Evonic, Flamerite, Focus, Gazco, Manor, Oak, Valor, Warmlite, Yeoman and many more. If you want the look of a stove, with instant glow, instant flames and instant heat, you could consider an electric stove. 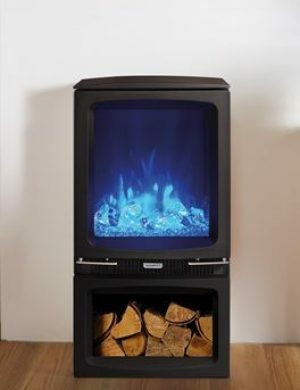 You do not require a chimney or hearth, just plug it into a standard 13amp socket. Electric stoves open up new possibilities for you to have warmth and character in your home, perfectly mirroring the look and atmosphere of a real woodburning stove. They are safe to use in most locations around the home or conservatory, in fact any room without a chimney. They can be moved from room to room and fitted into spaces where it would be difficult to install a flue for a real woodburner. It truly is real fire ambience, at the press of a button. They have very realistic and variable flame patterns, with traditional coal or log effects. You can enjoy a perfect picture of warmth, at any time without the heat, allowing you to enjoy your fire all year round and they are very easy to operate as well. Most people just like to turn the stove on to give them a lovely glow in the room and as most electric stoves have energy efficient bulbs, their running costs are relatively low as well. Electric stoves come in a variety of different sizes, designs and colours, often having a remote control. Most also have thermostatic control, which means that you can leave the stove on and it will only switch on the heater, if the temperature in the room, falls below the setting you have chosen. Most stoves also offer the option of fitting an artificial flue pipe, to give your installation that additional authentic look.